Good with Other Dogs? Can be dominant. Needs a strong leader with a structured daily routine. Update 02/09/19 – Noodles is still available for adoption and he is now 8 years old. Yes, he has been in foster care over 4 years. He is a poodle blend. All he needs is someone who has common sense about dog behavior…. 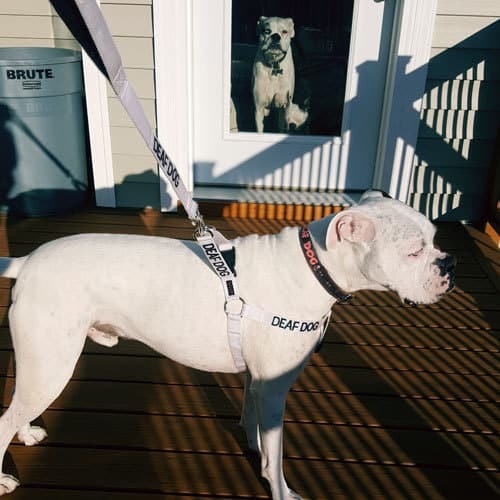 Meet sweet 5 year old adoptable deaf dog Noodles who is looking for a loving home. He is compact little pup at only 25 pounds. He would do much better in a home with no children. From Cathy Maloney. Noodles is still available for adoption. He needs a new foster home or forever home with larger more confident dogs. I send my Thanks, for this site, to help those great dogs without the advantage of sound. Mr. Noodles is luckier than most I feel, as he was fostered by a woman bent on giving him a leg up, by the assistance of special trainers familiar with this birth defect. Other than his inability to hear he is normal and thriving. He has had the best she could find to help him, blend in with other dogs. He is ready for a home not worried about the hearing issue. He is normal, and very very active. He needs to be a subordinate pack member. He has had a chance to be the dominant in her home, but we found he couldn’t handle the freedom all alone in a home. He needs the pack mentality to keep him in check. Does this make sense. He is smart as a whip, loves baths. He can be seen running through her home to lunge into a bath filled with bubbles. He will create his own games for fun. But it is apparent now it is a dog behavior issue that is holding him back. Nothing to do with his hearing loss. So we are looking now for a new foster with confident, preferably larger dogs than this poodle blend we lovingly call Noodles. I don’t know how it is possible but sweet Noodles is still available for adoption. He is now 3 year old. Meet sweet Noodles, Hi is in Rolling Meadows, IL. He is a 5 year old male Shih Tzu mix. He is looking for a special forever home of someone who will love him and take good care of him. Hi! My name is Noodles and I wound up at Animal Care & Control after being confiscated. Luckily, I got out of there and after a new hair cut/grooming and some TLC, I’m a new man! I’m a young guy, not quite 2 years old, and I love to play with toys, run around the yard and cuddle with my foster parents. Did I mention I can’t hear? Well, that doesn’t stop me from having a good time. Maybe you want to be my permanent cuddle partner? I am neutered, up to date on my shots and microchipped. I’d prefer to be an only dog, but do get along with some other dogs.